Jeanne Leske, 68 years old, prepares herself for her swimming heat in the locker room during the National Senior Games swim meet that took place at the University of Minneapolis Aquatic Center in Minneapolis, MN. on Jul. 8, 2015. This was Leske's first National game. Sue Ketterer shows off her piercings during the 2015 National Senior Games swim meet. This swim meet took place at the University of Minnesota's Aquatic Center on July 4th, 2015. Kay Poole (left) of the Silver Spirits attempts to pass the ball as Jacqueline Stephens (right) of NOVA United Classics blocks her during the National Senior Games basketball competition. This competition took place at the St. Thomas University Basketball Court in St. Paul, MN. on Jul. 9, 2015. The Shinkara volleyball team relaxes after finishing a volleyball match that took place during the 2015 National Senior Games Volleyball Competiton on Jul. 15, 2015 in Minneapolis, MN. Patricia Henderson (left) dances as she guides her sister, Vivian Stancil (right) to the bleachers during the National Senior Games swim meet that took place at the University of Minneapolis Aquatic Center in Minneapolis, MN. on Jul. 8, 2015. Stancil is legally blind and has won 188 medals in swimming. She also runs a non-profit organization and has a position on the commision board of Riverside, Calif.
A Senior Games swimming contestant poses for a photograph during the National Senior Games swim meet that took place at the University of Minneapolis Aquatic Center in Minneapolis, MN. on Jul. 8, 2015. 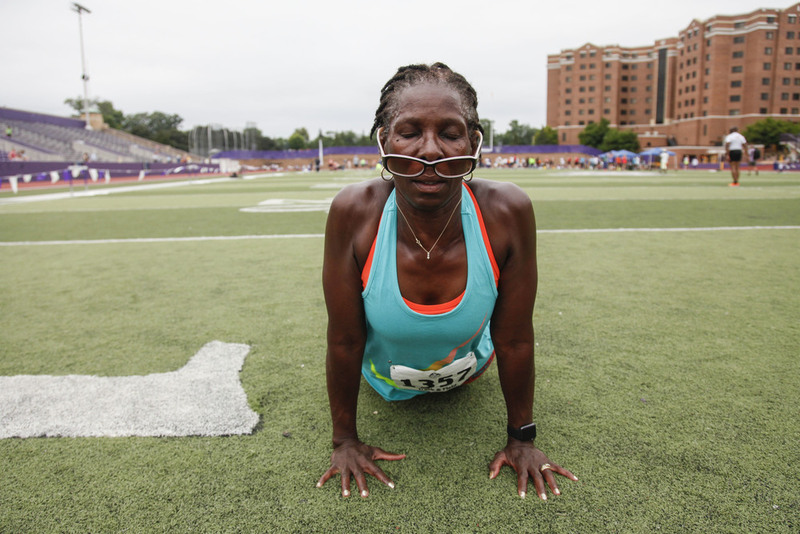 Regina Stewart, a runner participating in the 2015 National Senior Games Track and Field event, stretches in between heats on the St. Thomas University Field in Minneapolis, MN. This event took place on Jul. 14, 2015. Judith Winston of the NOVA United Classics stretches before her game during the National Senior Games basketball competition. This competition took place at the St. Thomas University Basketball Court in St. Paul, MN. on Jul. 9, 2015. Jerry Braun, 76 years old, shows off her leg in between shuffleboard games at the National Senior Games. "I tore my ACL and the doctors tried surgery on my legs multiple times. I just told them to cut it off." Braun is a Vietnam veteran, former army medic, captain and current participant in the National Senior Games. Both her and her husband normally participate in javelin throwing, which wasn't offered this year. Her husband is also a Vietnam veteran who went on three tours. An athlete stretches next to a Humana sign during the 2015 National Senior Games basketball competition that took place on Jul. 14, 2015 at the University of St. Thomas Basketball Court in St. Paul, MN. Wayne Kihune (left) and Jerry Schletzbaum (right) of the Hawaiians shake hands after a game against Taylor Law during the National Senior Games basketball competition. This competition took place at the St. Thomas University Basketball Court in St. Paul, MN. on Jul. 9, 2015. 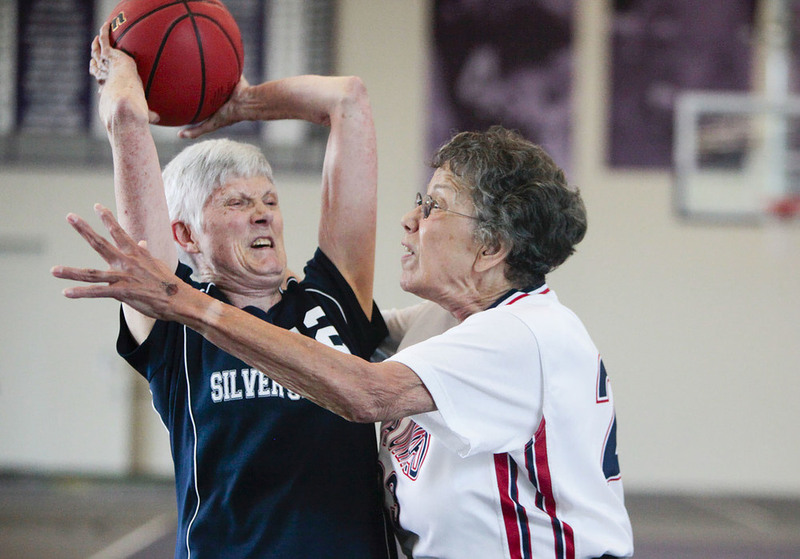 (From left to right) Fellow Silver Slammer teammates Jean Russo, 80 years old, Ann Lucas, 86 years old, and Jeanne Baker, 81 years old, laugh during the 2015 National Senior Games basketball competition. This competition took place on Jul. 14, 2015 at the University of St. Thomas Basketball Court in St. Paul, MN. Russo and Lucas are the oldest ones of the Silver Slammers and both hail from New Orleans. Baker hails from Connecticut. Former Globetrotter Tony "Bones" Davis warms up before a game against USA 80's during the 2015 National Senior Games basketball competition that took place on Jul. 14, 2015 at the University of St. Thomas Basketball Court in St. Paul, MN. "Champions" focuses on the athletes of the 2015 National Senior Games. The Games have been running as the largest multi-sport event for Senior since 1985, consisting of 19 different sports for men and women 50 & over.